Continuing to uncover fossil evidence along the coast of South Carolina, researchers, led by a faculty member at College of Charleston, have discovered a species of extinct dolphin. The toothless dolphin, which lived about 28-30 million years ago, provides new evidence of the evolution of feeding behavior in whales (which includes dolphins). The species, named Inermorostrum xenops, lived during the same period as Coronodon havensteini, a species of ancient whale announced recently by investigators at New York Institute of Technology College of Osteopathic Medicine and College of Charleston in Current Biology. 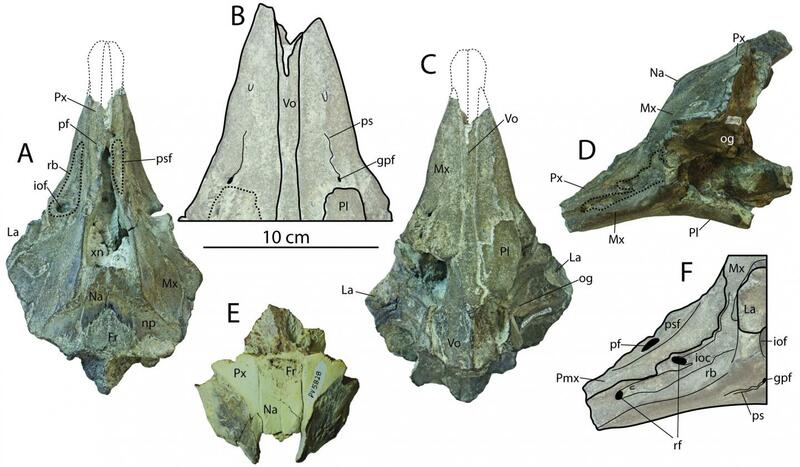 The skull of Inermorostrum was discovered by a diver in the Wando River in Charleston, just miles from the location where Coronodon's remains were found, and presents the first clear evidence of suction feeding in echolocating sea mammals. The researchers estimate that the dolphin grew to be only four feet long, smaller than its closest relatives, and significantly smaller than today's bottlenose dolphins, which measure seven to twelve feet in length. According to College of Charleston adjunct geology professor Robert W. Boessenecker, Ph.D., the dwarf dolphin had a short snout and entirely lacked teeth. The genus name, Inermorostrum xenops, means "defenseless snout," referring to its toothless condition. Boessenecker, the lead author of the study, believes that the suction-feeding dolphin fed primarily on fish, squid, and other soft-bodied invertebrates from the seafloor, similar to the feeding behavior of a walrus. Furthermore, a series of deep channels and holes for arteries on the snout indicate the presence of extensive soft tissues, likely enlarged lips, and also perhaps even whiskers. "We studied the evolution of snout length in cetaceans, and found that during the Oligocene (25-35 million years ago) and early Miocene epochs (20-25 million years ago), the echolocating whales rapidly evolved extremely short snouts and extremely long snouts, representing an adaptive radiation in feeding behavior and specializations," says Boessenecker. "We also found that short snouts and long snouts have both evolved numerous times on different parts of the evolutionary tree -- and that modern dolphins like the bottlenose dolphin, which have a snout twice as long as it is wide, represent the optimum length as it permits both fish catching and suction feeding." Research team member, Jonathan Geisler, Ph.D., chair of the Anatomy Department and associate professor at NYITCOM, says the discovery is an important step in understanding why the South Carolina Coast provides unique insights into cetacean evolution. 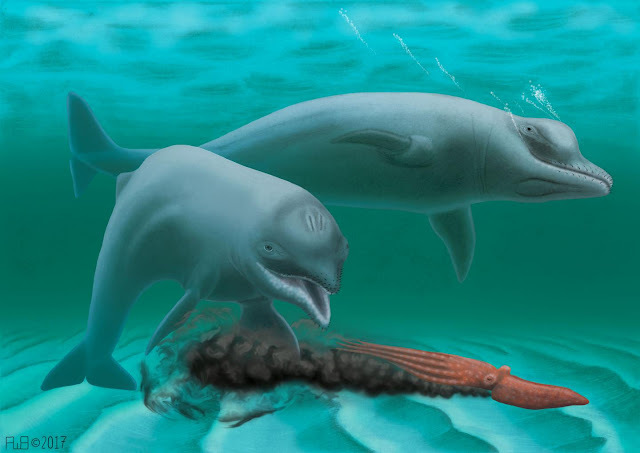 "Coronodon, a filter feeder whale, and Inermorostrum, a suction feeding dolphin, may well have fed on the same prey. Their feeding behaviors not only help us understand their vastly different body sizes, but also shed light on the ecology of habitats that led to Charleston's present-day fossil riches," says Geisler. Dr. Danielle Fraser, a paleontologist at the Canadian Museum of Nature and also part of the research team, notes that the identification of Inermorostrum opens up new questions about the evolution of early whales. "The discovery of a suction feeding whale this early in their evolution is forcing us to revise what we know about how quickly new forms appeared, and what may have been driving early whale evolution" she explains. "Increased ocean productivity may have been one important factor," she says. Many species of Oligocene whales have been described from South Carolina, with several discovered in and around Charleston. The area is among a few in the world, including others in New Zealand, Japan, and the Pacific Northwest, to offer a window into early toothed whale evolution. Inermorostrum xenops is now on display in the Mace Brown Museum of Natural History at College of Charleston, reunited with its prehistoric neighbor Coronodon havensteini. The study has been released in the journal Proceedings of the Royal Society B.